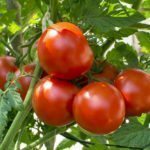 What vegetables can I plant mid-summer? I just harvested garlic and have an empty raised bed. What would be a good crop to plant mid-July in soil depleted by a garlic harvest? Green peppers occupy one-half the bed.